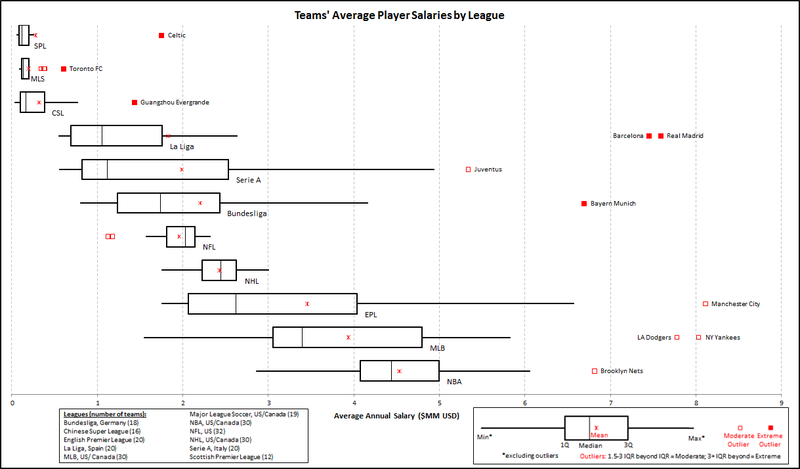 Which Leagues Have The Highest Average Player Salaries? This week, Sporting Intelligence and ESPN the Magazine released the Global Sports Salary Survey 2014, a worldwide look at which leagues pay the most on a per-athlete basis. To help break these figures down, Reddit-user DrinkDaddysWater compiled the data into the boxplots above. For those not familiar, the rectangles stretch from the 25th-percentile team to the 75th-percentile team in each league, with the median marked as the black line and the mean marked as the red "x." The dots that fall beyond the boxplot "whiskers" are outliers, which in this case are mostly crazy rich teams. The NBA's average salary of $4.5 million makes it the highest-compensated league, but Manchester City is the highest-paid team, with an average salary of $8.1 million (all figures U.S.). Only four other squads—the Yankees, the Dodgers, Real Madrid, and Barcelona—crack the $7 million mark. As the box plots make clear, this gap means more in La Liga, which has a median salary around $1 million, than it does in the EPL or MLB. So, if you're trying to maximize your salary, which league should you aim for? While it seems like the NBA is the way to go, this data doesn't really tell the whole story—namely, that you are bad at sports and will never play in any of these leagues.